I enjoy growing plants in terrariums, even though I have found that maintaining a nice-looking terrarium isn't as easy as it might seem. 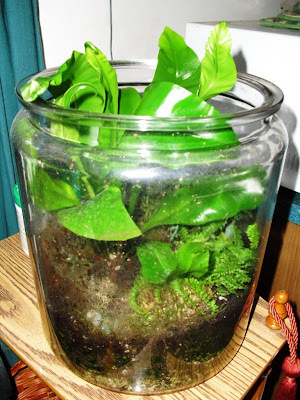 Just before Christmas, I replaced a scraggly-looking fern I had growing in a vase terrarium with a brand new one. The then-new fern can be seen here, in the tall vase on the right. (The "lid" is actually a glass saucer.) I don't have a positive ID, but I believe that the fern is a Nephrolepsis. 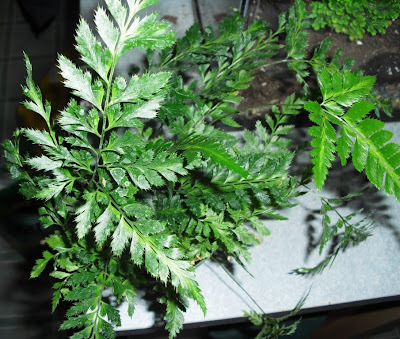 During the holidays, when my terrarium grouping was moved to accommodate our Christmas tree, the fern started to decline, and by late January, it had turned completely black. When I removed the dead plant, I found the soil to be excessively wet, and I realized that I had watered this terrarium a little too well when I replanted. So after emptying out the soggy soil, and cleaning the vase thoroughly, I set out to find a replacement plant. I went to my usual nurseries and local box stores, and none of them had any suitably-sized ferns for sale. So I went with something a little different. When I decided to post a picture of my new plant, I realized I had missed an opportunity. I could have made things more interesting by showing some of the process of planting the terrarium. So this week, when I decided to give a crowded Asplenium nidus some more growing room, I also decided to take some pictures of what went into assembling its new home. 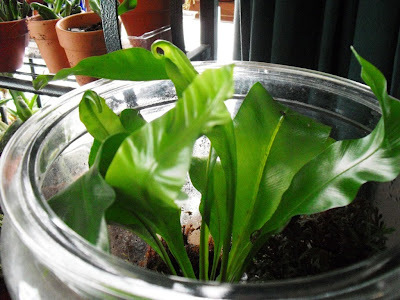 Previously posted pictures of Asplenium nidus outgrowing its glass cookie jar. Normally I keep the lid on, which has caused some damage to the fronds. The first thing I did was add a layer of gravel. This is also a good time to add some charcoal to keep the soil fresh. I didn't, since I forgot to buy some. Oops. I don't think it will make much difference in the long run. For step 2, I added a layer of potting mix, which I forgot to photograph. This is just as well, as it was definitely a "do as I say, not as I do" moment. The mix I used was quite dry. Using a moistened medium is generally better, as it is easier to work with. 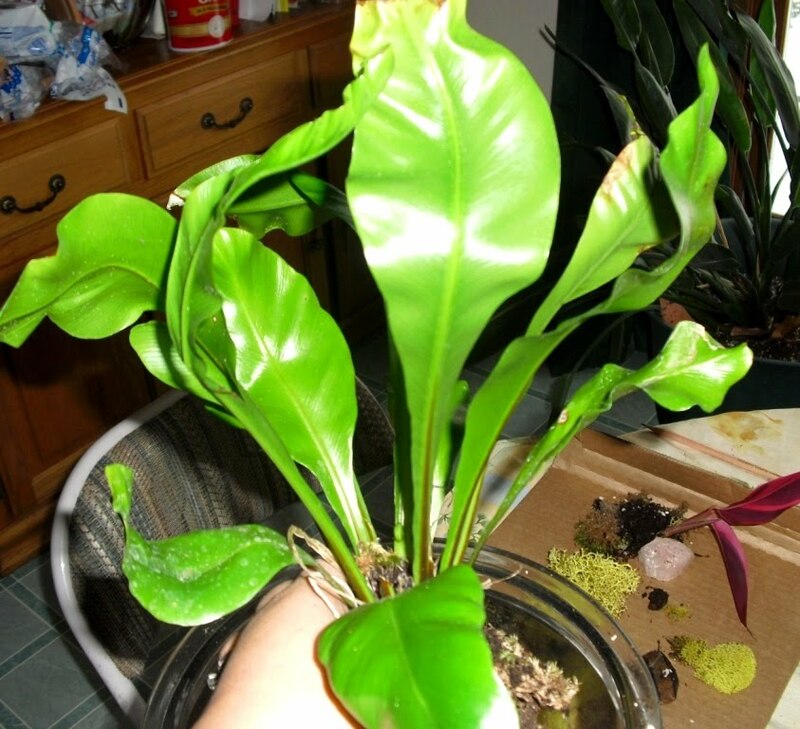 The somewhat battered Asplenium, removed from the jar. A brand new Selaginella, purchased to round things out. Dried moss purchased from the same pet store as the aquarium. 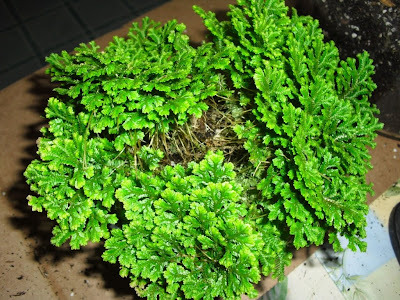 This is actual living moss, meant for terrarium use, which will be rejuvenated when introduced to a moist environment. Preserved moss from the craft store. This is not a live product, but it adds visual interest, holds up for some time, and can be easily replaced when it starts to deteriorate. Top view of the planted terrarium. Side view. 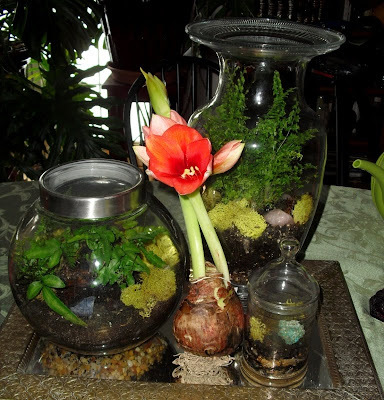 I use mineral specimens and river rocks to add interest to all my terrariums and dish gardens. I used amethyst (purple) and sodalite (blue) in this one. 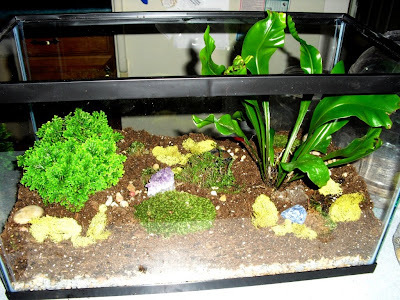 The completed terrarium, watered and in place. The plastic cling rap is only temporary, just to raise the humidity a bit. I have asked my husband to make a permanent lid of leaded glass for me. But wait! There's more! I couldn't very well leave the cookie jar empty. As it happened, one of the nurseries did have some smaller ferns available today, so I purchased this one. I haven't a clue as to its identity. Replanted jar with another small Stromanthe sanguinea 'TrioStar', the new fern, and the mosses. I now have a total of six terrariums around the house. 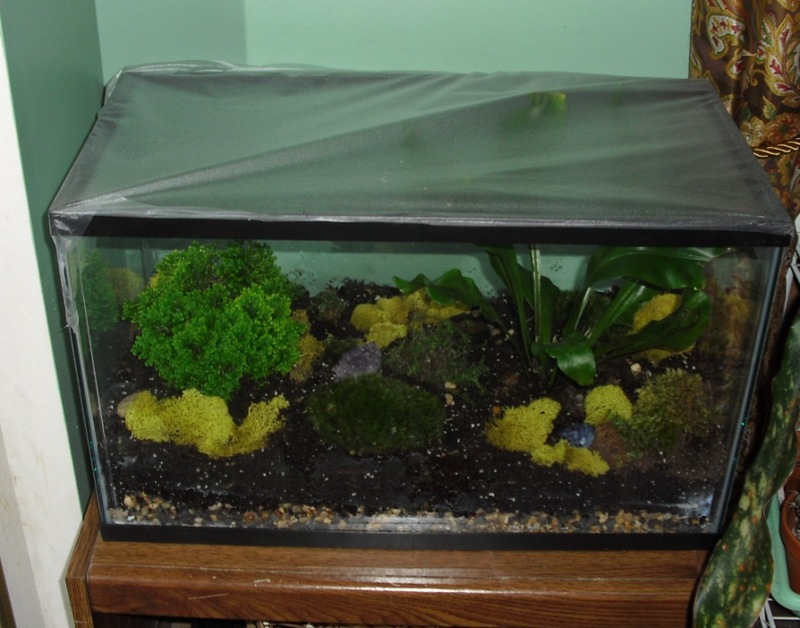 I also have an empty one gallon aquarium available, so I expect the number will increase to seven some time in the future. These are all so pretty! 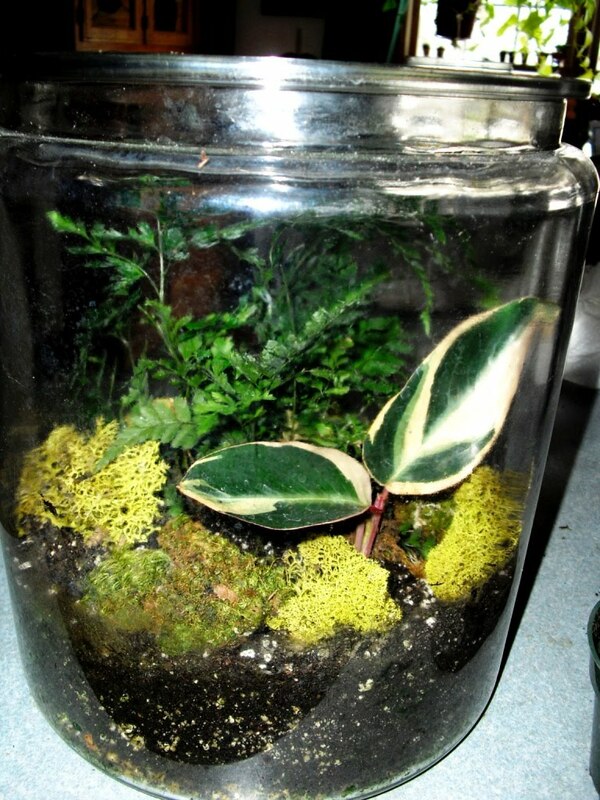 One day when I have NO kids around, I will make some terrariums again! I've only got two terrariums so far - one large pickle jar and one glass vase. I keep meaning to make more, but I never get around to buying more glass containers. New ones are just too expensive for me, and finding secondhand ones is quite time-consuming! 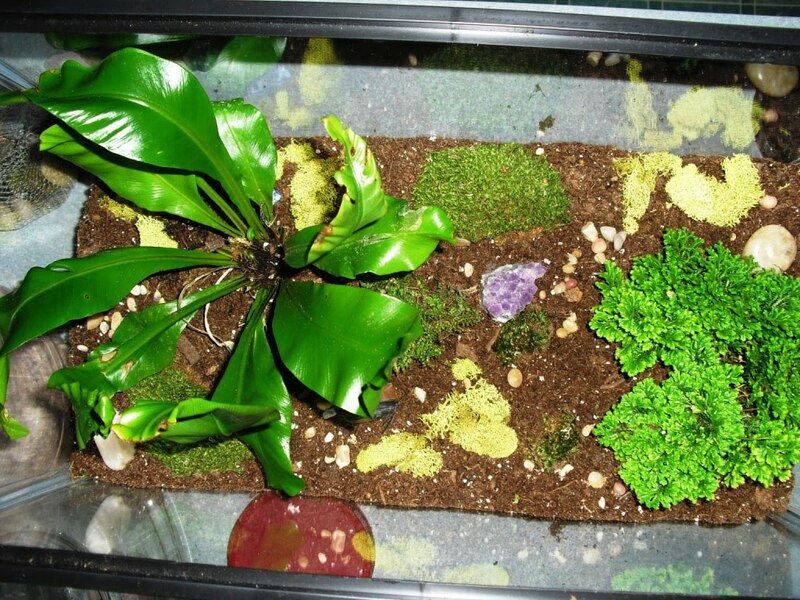 I'm always lazy with mine, keep the plants in their pots so I can easily remove them when they get too big, and just stuff in some sphagnum all around them to hide the pots. Works fine so far - I think there are some Nephrolepis offsets growing in the sphagnum already. And cling wrap for the top - that's a permanent thing here! Doesn't look so great on the vase, but oh well. It's cheap and transparent. Very very nice! What a great job you did! 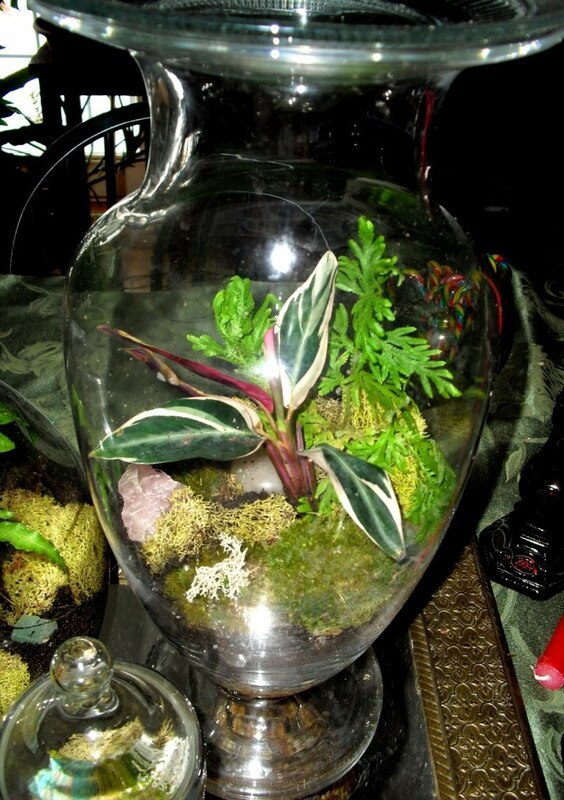 I should make a succulent terrarium.